This article was copied and pasted from Two Coats of Paint written by Sharon Butler. 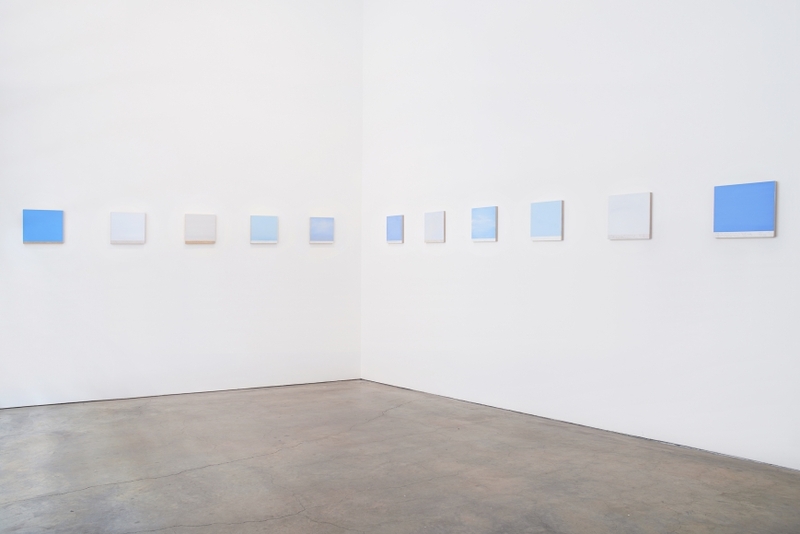 Check it out..
Every Sunday, Byron Kim makes a painting of the sky. 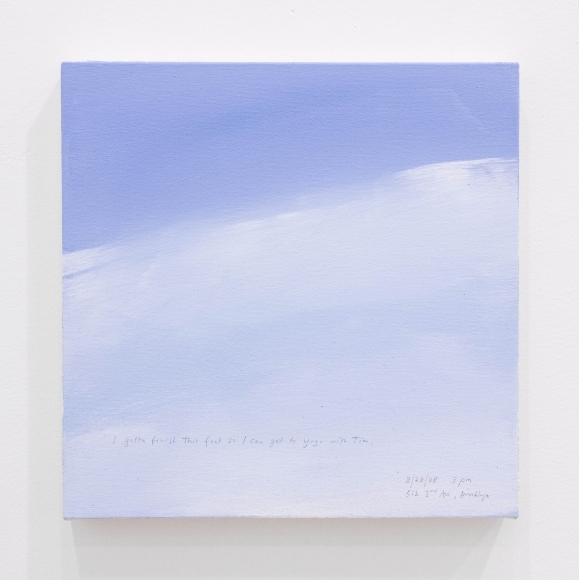 One hundred of these purposefully unremarkable small canvases are on view at James Cohan through February 17. What makes them unremarkable are their size and the undramatic skies they depict – not the complex, sublime sky paintings made by, say, great Dutch painters like Aelbert Cuyp and Jacob van Ruisdael. Instead, they are simple renderings with a limited palette of blue and white, and a bit of light grey for the odd cloudy day. 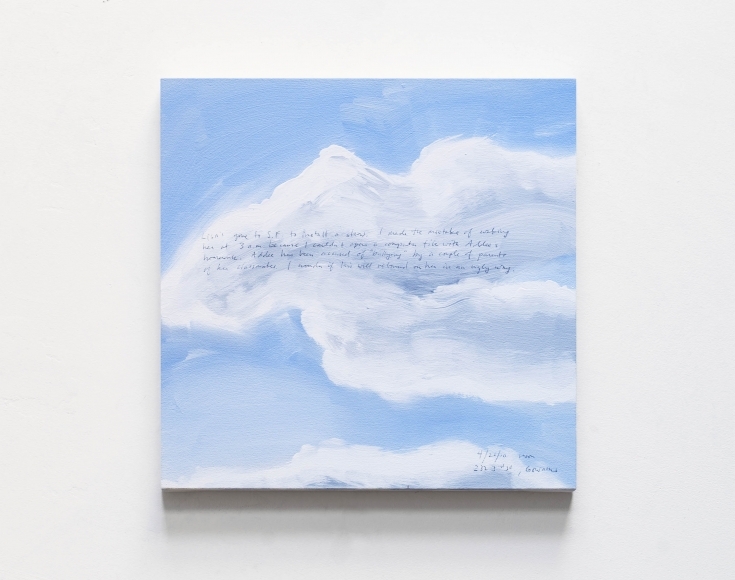 Rather than offering an expansive view or capturing the subtle color ranges in cloud forms, these paintings convey a dainty sense of claustrophobia and ennui but no real sense of joy or wonder. It is as if the monotonous ritual of making a painting a week were more important to Kim than the painted image itself. 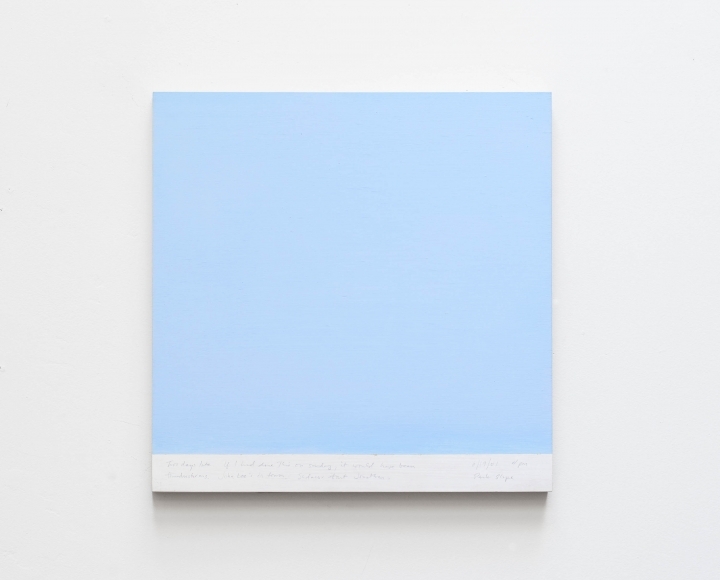 Thus, in Kim’s exhibition, quantity, habit, and process seem to trump the quality of the individual paintings. 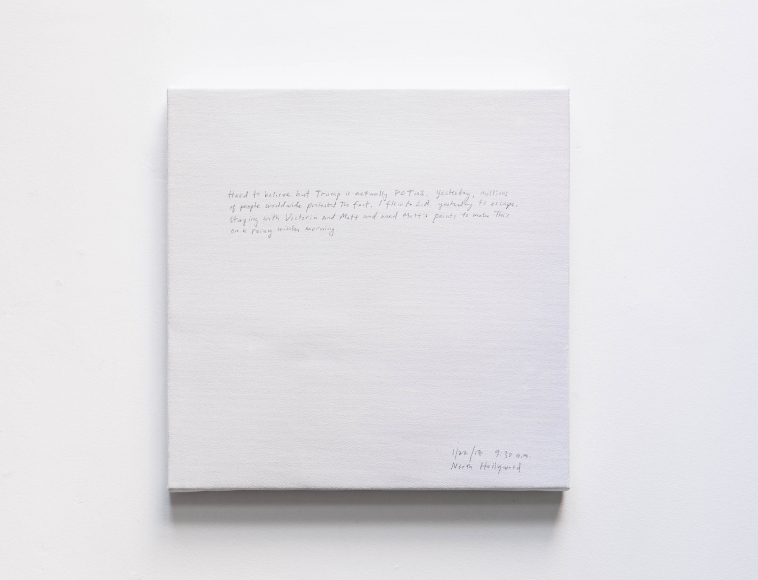 Reinforcing this point, Kim has handwritten a prosaic note about the day on each painting, perhaps as an indication that Kim’s ambition and concentration have gone missing in the mire of family life and all the yawn-inducing tasks that a successful artist must perform. Kim may be living the dream, but it doesn’t seem very transporting. Byron Kim, Sunday Painting 4:20:10, 2010, acrylic and pen on canvas mounted on panel, 14 x 14 inches. 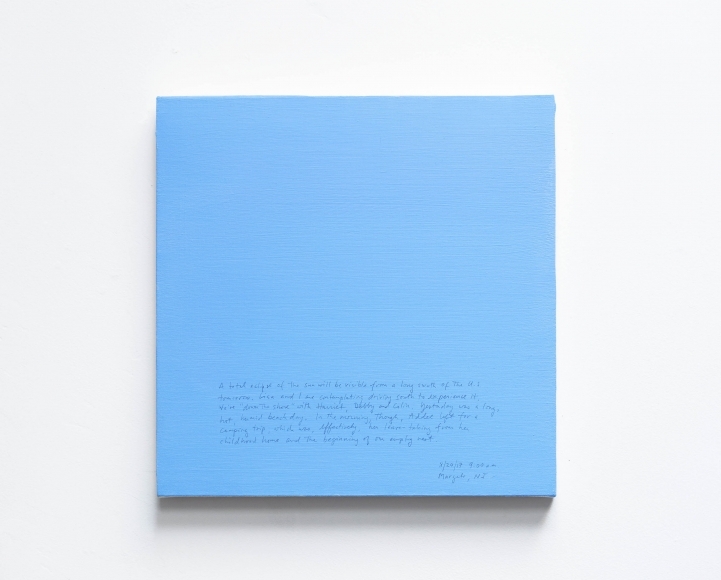 The project reminds me of On Kawara’s Date Paintings. Each day Kawara crafted a painting of the date in the ubiquitous sans serif typeface Helvetica. In the box where he stored the painting, he also included a page of the newspaper from the city where he was working. 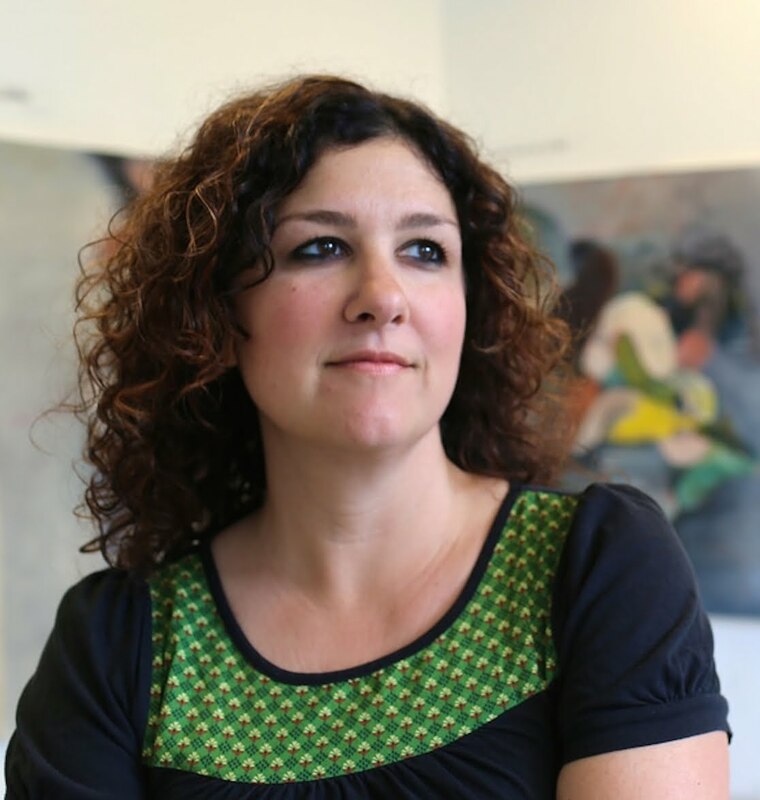 Like Kawara, Kim is interested in the idea of maintaining a serial approach rather than engaging with the materiality of paint. But Kim’s project also conjures a link to more painterly perceptual artists, such as Lois Dodd and Giorgio Morandi. Morandi spent his life painting easel-sized still-lifes that depicted small cups, bowls, and other tabletop vessels in tertiary colors, even as World War II raged around him. Lois Dodd has painted the landscape around her familiar Maine homestead for decades, and the resulting body of work is a moving record of a quiet and dedicated life. Both Morandi and Dodd focus narrowly on translating their immediate surroundings with great painterly nuance onto canvas to convey the emotional timbre of their lives. 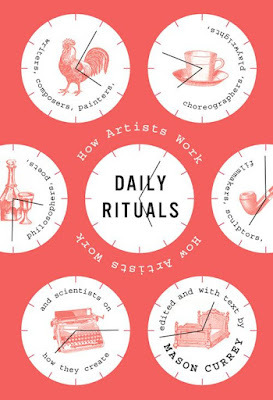 In this distracted age, especially as the big picture becomes increasingly daunting, it’s undeniably tempting for artists to employ this kind of approach as a kind of refuge. Kim presents an alternative escape, whereby grim routine isolates the artist and decontextualizes the personal content of his work. It’s rather dispirited, and perhaps a sign of the times. 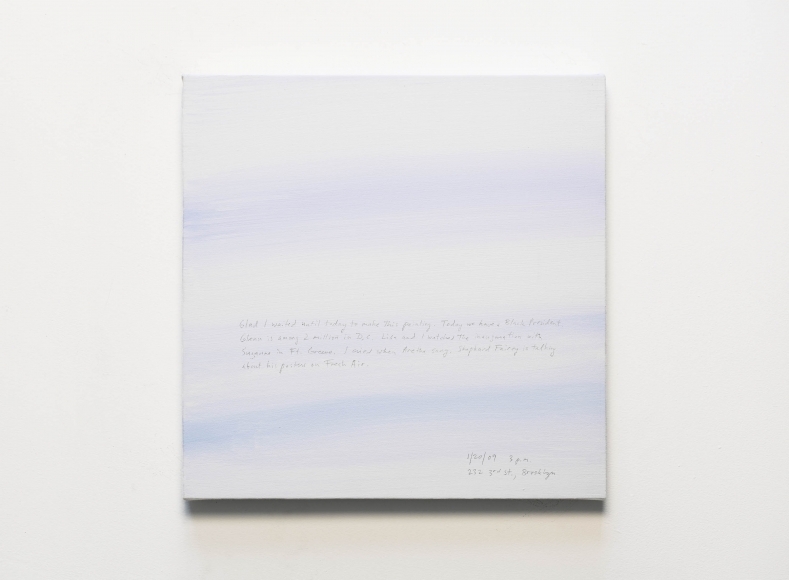 “Byron Kim: Sunday Paintings,” James Cohan Gallery, Chelsea, New York, NY. through February 17, 2018.